Painting the Town and a Frittata, too! Who doesn’t love breakfast for dinner? It’s fun and easy. And if you want to just make one dish that will serve several people? Make a frittata. This Italian omelette serves many purposes. It’s simple to make, can help you use up any vegetables in the fridge or even leftovers and can be ready to serve in 20 minutes! But the best part? You can make it in advance and serve it at room temperature, which is why I am making one to accompany me on an adventure. A group of local bloggers and I have been planning a Girl’s Night Out! We’re headed to a brand new concept called Pinot’s Palette where we will drink, eat, paint and have fun. The concept is big in Houston, since that’s where it started and we’re excited to celebrate this new location in San Antonio. Admittedly, I am somewhat creative, but not in a “painting” kind of way. I can cook and write, but artsy-fartsy, Martha Stewart stuff is not my thing. For one night, though, I am putting aside my inhibitions and I’m excited about having fun with some girlfriends. 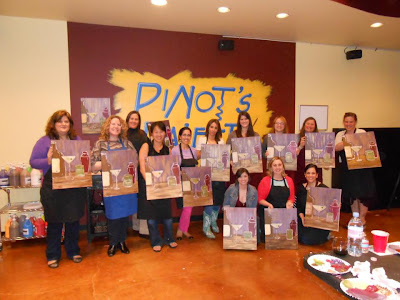 The idea of Pinot’s Palette is a simple one–gather up a group of friends, co-workers or you could organize a private party–bring your own drinks and snacks and make a reservation to paint the town! 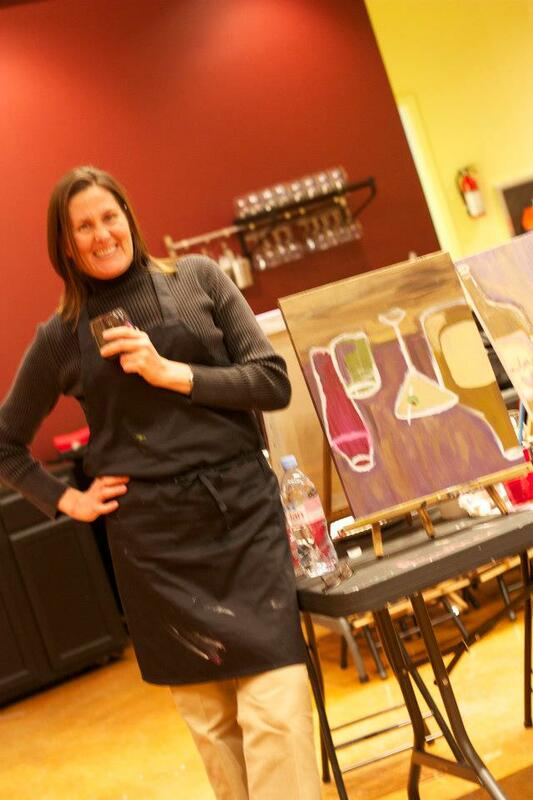 Every Thursday, Friday and Saturday, a different masterpiece is featured and a qualified instructor leads you through the process of painting the image that you take home. They play great music while you work and you sip your wine and loosen up as your very own masterpiece comes to life right before your eyes! Of course I painted mine upside-down! Yes, there’s lots of laughing, talking and silliness and that’s what makes this evening so utterly enjoyable. If you need a night out with the girls in an environment that encourages creativity, camaraderie and conversation, this is it. 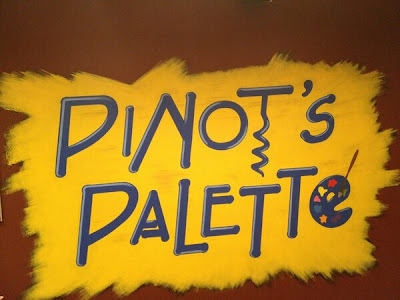 Located at the corner of Broadway and Sunset in The Collection shopping center, Pinot’s Pallete awaits you and your friends. Every time you look at your painting, you’ll pause to reflect on the fun night you enjoyed with friends and I bet you’ll want to do it again! 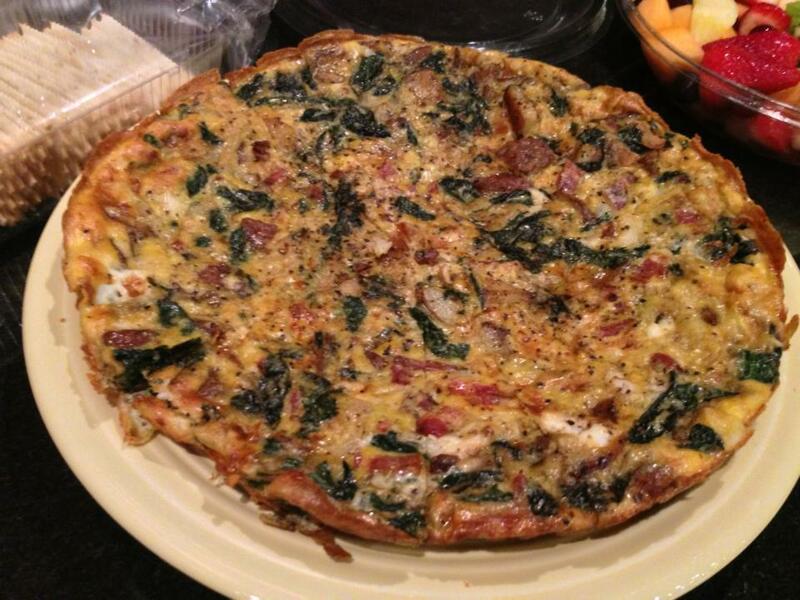 So when you do, here’s the recipe for the frittata I made that we devoured. Disclosure: Our group received complimentary admission for this special occasion. The best thing about a frittata is that you can use what you have one hand. Potatoes? Sure. Asparagus? Absolutely? Spinach and leftover Italian sausage? You bet. I picked up red potatoes, Swiss chard and onions at the farmers market last Sunday to make this dish for my GNO and then added a few pieces of bacon. But, really, I would use whatever you want. Mushrooms, cheese, bell peppers. Just make sure you use pastured eggs from happy chickens! In case you want o duplicate what I made, here's how you do it. In a large, non-stick saute skillet over medium high heat, add olive oil and then place the chopped Swiss chard. Lightly sprinkle with salt and pepper and stir to coat with the oil. Cook until it wilts. When the chard is cooked, put it on a big plate and set aside. Add more olive oil to the skillet and then the onions, sprinkling with a little salt and pepper. Let them cook and soften for about 10 minutes. You don't want these to caramelize--or maybe you do. When the onions are done, place them next to the chard on the plate and then cook the bacon. When the bacon is done, place it on a few paper towels to soak up the grease and then add the cooked and chopped potatoes to the still heated pan with the bacon grease and stir well to coat. Sprinkle the potatoes with salt and pepper and let them cook over medium high heat so they crisp up nicely. While the potatoes are cooking, you can eat one piece of bacon and chop the rest. When the potatoes are ready, remove them and place on the plate with the chard and onions. In a big bowl, add the eggs and beat them well. Add two tablespoons or cream or milk and whip to combine. Sprinkle with salt and pepper. In the same skillet you have been using, add enough butter to coat the bottom of the pan and place over medium heat. Pour in the eggs and gently scatter the mixed vegetables and bacon over the eggs to combine. Let the eggs cook slowly. When the bottom of the frittata is set--about 8 minutes--sprinkle the grated Parmesan on top and place the skillet in the oven to cook through. When the frittata is done, flip on the broiler and let the top get golden brown. Remove from the oven and let cool thoroughly. Slice into quarters or eighths and lightly sprinkle with crunchy Maldon salt and more pepper. Serve as an appetizer or as an entree with salad and watch it disappear.